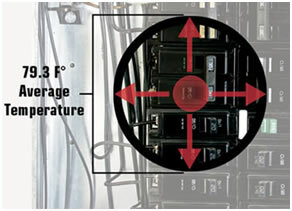 IR thermometers (a.k.a. temperature guns) may seem inexpensive and simple, but they only read one average spot measurement at a time, making them painstakingly slow when scanning multiple targets and large areas. Thermal cameras like FLIR i-Series, on the other hand, let you see the whole picture instantly. 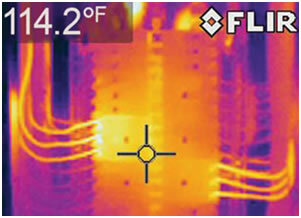 And they capture thousands of temperature measurements in every image, even from a distance, making them safer to use especially when diagnosing electrical problems on energized equipment. Whether you’re just getting into thermal imaging, or are so convinced of its effectiveness that you want to outfit everyone on your crew with an infrared camera, the new FLIR i-Series is the answer. Still looking for problems one spot at a time? Temp guns don’t necessarily detect what’s under the laser dot; they only show an average temperature of an area. And the farther away, the less accurate. Thermal cameras give you thousands of accurate temperature readings in every image, so you’ll get the whole picture – up close or far away.